We've listened to the brand new album from 1000mods, and we offer you two back to back reviews on how it sounds like! "Applaud the change, critical about the rest"
In 2011 Chiliomodians released their debut album “Super Van Vacation”. An album well received not only in Greece but also in a worldwide scale. Fairly if you ask me, since it had it all. Inspired compositions, dynamite riffs, a lot of groove and a bulky production making the record, an unstoppable steamroller. Myself, among a lot of people I enjoyed every second of SVV (I still do quite often). Two and a half years have passed – in the meantime they released “Valley Of Sand” EP – and here they are today with their second full-length called “Vultures”. 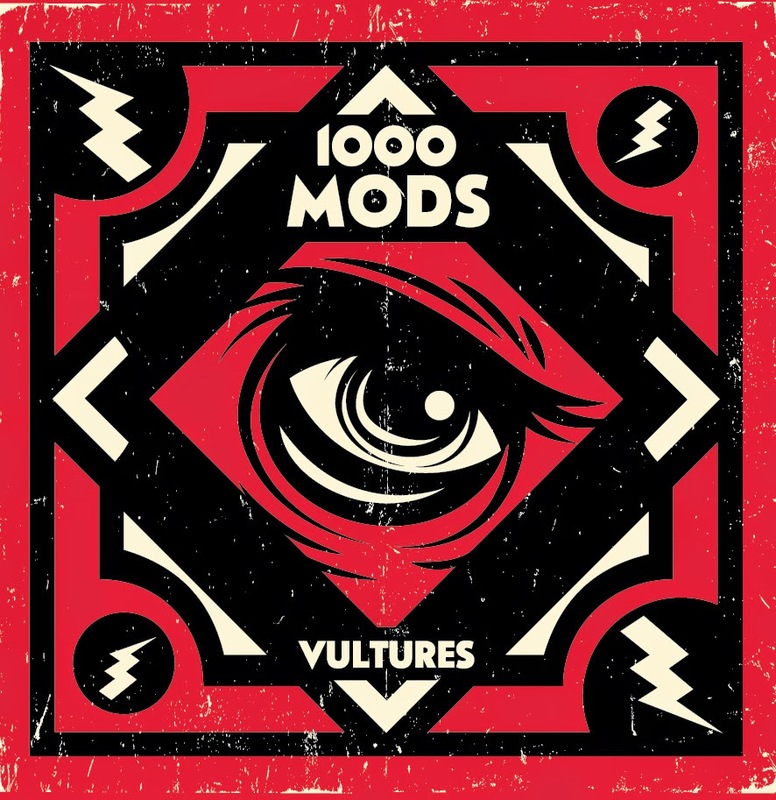 First things first, 1000mods in “Vultures” changed their stance towards their sound. They lean more to rock than heavy – at least compared to “Super Van Vacation”. That’s not necessarily bad of course. Personally I don’t mind a direction like this. Perhaps it’s for the best. Someone could say that their music took a more “radio-friendly” turn. You can see it only by checking their songs’ duration, with the longest one “Reverb Of The New World” being a bit less than seven minutes. Burning jamming parts are not as present as they used to be neither their debut's bursting, exploding moments. I don’t judge them of course. It’s a smart move, knowing that they have a really strong and dedicated fan-base which will brace whatever they release, they’re taking a step further and open themselves to a wider audience. It's always good to see a band you like (and even more if it comes from your local scene), getting more well-known even to music fans that they had nothing to do with this sound before. However, there is always a risk and in that case Mods took it successfully. Generally “Vultures” let me down. And not for the above mentioned reasons. It seems to me that the album was released because it had to be released. Two years and a half, after their debut was out, it makes sense for them to feel pressure of putting out some new music. And maybe that’s why, as a whole “Vultures” lacks of inspiration and interesting compositions. Yes, stoner rock was never a beacon of novelty but still it doesn't mean you can’t have some intriguing formations. Some will argue that you have to listen it a lot of times in order to get into it (something I did apparently for argument's sale). Or grow in you. Come on people, here we're dealing with stoner/heavy rock. Not some kind of progressive, experimental, multilayered pieces that you have to analyze them mathematically for two days and then start liking them. It either gets you or not. Did you have to listen “SVV” ten times, before blasting your head off? No? I didn’t think so. From the album's 8 tracks, only two touched me. The first one is “She” which could be easily a song by Asteroid having a different singer and “Low” which is the closest thing to their previous work. I’m guessing that “Claws” and “Big Beautiful” would be the hits here (or maybe “Horses Green”, a song offered for sing-along). Their longest tune “Reverb Of The New World”, with its huge intro/build-in (two and a half minutes out of ~seven) could be “Super Van Vacation” (the song) ending point. That’s why I believe “Vultures” could be easily “transformed” into an EP. Then it could be much more solid and efficient. All in all, I’m not saying that “Vultures” is a bad album neither that it’s unbearable or something. It’s just too bland. In my ears it lacks of fire and interest. It’s like a forced album that it had to be released on a deadline. I think that if it wasn’t for a Greek band (where want it or not, I’m getting more involved), I would have listened a couple of times and forget it after a while. And to make it clear once more and get ahead of anyone saying that comparing "Vultures" with "Super Van Vacation" is unfair, I'm not against the changes they made. On the contrary. I'm talking about inspiration, dynamics and cojones; and SVV had all of them. Nevertheless I’m sure it will be praised by the majority out there and it will be in a lot of top 10 lists at the end of the year (in Greece) but... People! Wouldn't be better getting a bit more critical with the music and the bands you love, hm? It can only work positively for both sides. Anyway, I’m just waiting to catch 1000mods live again soon, probably this summer in Fuzztastic Festival, since their gigs are always a blast and of course see what the future brings for them. "Highly addictive vultures but I would like them to have some heavier big beautiful claws"
One of the reasons the Greek “stoner” / heavy rock scene gained a lot of attention the last years is undoubtedly the release of “Super Van Vacation” by 1000mods back in 2011. An album so powerful and perfectly arranged, that despite the fact it was built “by the book” of this genre, had a totally unique, “hiliomodian” sound. Three years and nearly a hundred gigs later, the band from Hiliomodi steps in again, and introduces us their second album named “Vultures”. When a band has a killer debut album, there are usually two ways to follow, in order to make the second album. The first is to repeat the “successful recipe” of the debut, and the second way is to make a step even further in order to offer something new. 1000mods in “Vultures” clearly selected the second path. A clever but difficult path also. So if you expect “Super Van Vacation vol.2” you will be disappointed, at least in the first listening sessions. Keep that in mind, when you are about to listen to this album, because our initial pre-listening expectations always are a very significant factor in order to approach and finally enjoy a record . So, “how does ‘Vultures’ sound like?” The album kicks in with “Claws” and it is followed by “Big Beautiful”. Two straight forward and -nearly up tempo- rock songs, that give us a small hint on the sound changes 1000mods made in this record (especially when you bring in mind past hiliomodian opening tracks such as “Dope”, “Burnt Sleep”, and “Road to Burn”). The groove is still there, but the slow, heavy and super fuzzed out monster of the past, is unfortunately absent. Despite this, I think these songs will work better in gig conditions and eventually will bring even more fans aboard, but I have to admit that I would exchange them for a mythical heavy opening like “Road to Burn” (by far my favorite hiliomodian track). The record starts showing its teeth for real, in the third song named “She”. A slow, badass, blues influenced song, that gave me a big smile of pleasure when I listened it for the very first time. The tempo remains slow in the next song too, and “Horses Green” starts with a late 60’s riff, followed by some of the greatest vocal lines of the band so far. “Low” builds up slowly, and gradually gains pace, in order to finally evolve in a song that belongs in the high standards 1000mods set in the past, with songs such as “Set you free”. The following, record-titled “Vultures” track, is probably the heaviest song of the album, and maybe it is the natural link with the trademark 1000mods sound, as we knew it so far. In my opinion this is the song that completes a highly addictive foursome of songs (from “she” to “vultures”) and finally gives a critical flavor to the album. The coming up “Modesty”, is another straight forward, short song that rocks out, while it gives us the chance to listen for the very first time “Hammond like” keyboards by the end of it. The record’s final touch, comes with the “Reverb of the new world” a space - heavy rock jam that derives directly from the great Hawkwind School, showing us that the band can deliver successfully experiments like this. “So far, so good, but what’s your overall opinion?” you may ask. Well, clearly this is a song oriented album, and by saying that, I mean that it is made based on great vocal lines that will make you sing along passionately in the gigs. The tremendous progress in Danis’ approach of singing, proves that. This is also, a smart way not to repeat yourself, and it gives you the chance of adding even more fans to the hiliomodian worshipers army. But as I said before, I miss the big fuzzed out riffs this band can offer. I miss their “stoner doom” parts. And the reason I miss them so much, is because I know that in this field, 1000mods have no opponent and they can devour easily a lot of “heavy” bands of their generation, without even trying. In order not to be misunderstood, I’m not suggesting that 1000mods should have turned to be a full “stoner doom” band (they were never entirely a “stoner doom” band after all) but it would be nice if there was at least one song in this album that would represent this heavy aspect of 1000mods as in the past. Another little “complain” I have, is about the short duration of the album. Although we talk about a highly addictive record that you want to listen over and over again, I think that 38 minutes is not enough for a full length album. Despite my concerns above, we talk undoubtedly about a record that would be loved by fans and will maintain the band among the hottest heavy rock names in Greece. The reason is simple: “Vultures” is a sneaky, grower album that gains you a little more in every listen. And this is probably its strongest feature.